A new poll conducted by Studentmoneysaver.co.uk has put Labour as the favourite political party amongst students, closely followed by the Green Party, with the Conservatives trailing in third. The survey of over 1000 people found that the Liberal Democrat's share of the student vote has fallen from 22.2% at the last general election to just 3.7%. The poll also found high student voter mistrust of politicians, and over 60% of students disagreeing with the statement "politicians care about students". Lib Dem support drops from 22.2% to 3.7%. Only 12.9% of students who voted Lib Dem last time intend to do so again. 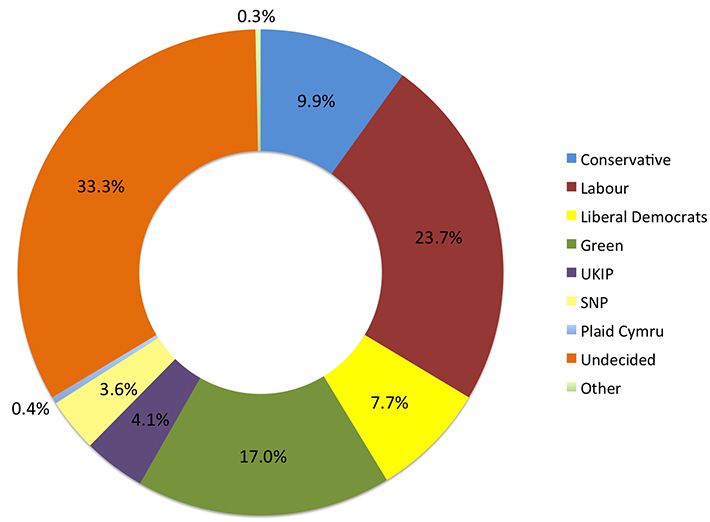 Green party have most loyal voters, followed by UKIP and Conservatives. 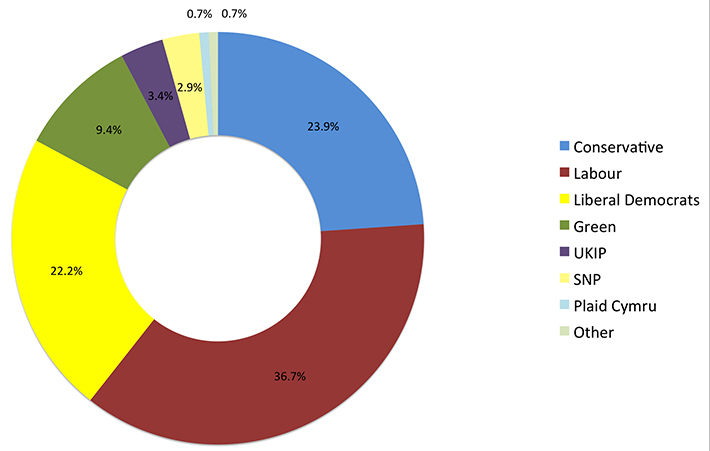 Who do you intend to vote for in the 2015 general election? Labour were out in front in the poll with 23.7% of the vote. The biggest surprise, however, was that Greens were the second largest party with 20.3% of the vote, leaving the Conservatives trailing in third on 15% and the Liberal Democrats behind UKIP in fifth place. 25.4% of students are still undecided. Comparing the results shows a large drop in support for the Liberal Democrats, who traditionally had high student support, and a major increase in votes for the Green Party. UKIP have seen an increase in support, more than double of what they received from students in 2010, but not as high as the 15% reported by YouGov earlier this week. Labour topped the poll with 23.7%, an 8.7% lead over the Conservatives, though they were only 3.4% ahead of the Green Party. “Young people have been let down by the Tories and betrayed by the Lib Dems, who have trebled tuition fees, scrapped the Future Jobs Fund and limited opportunities for young people – leaving over 750,000 still unemployed. Labour also topped the poll when asked "If you were voting entirely on education policy, who would you vote for?" 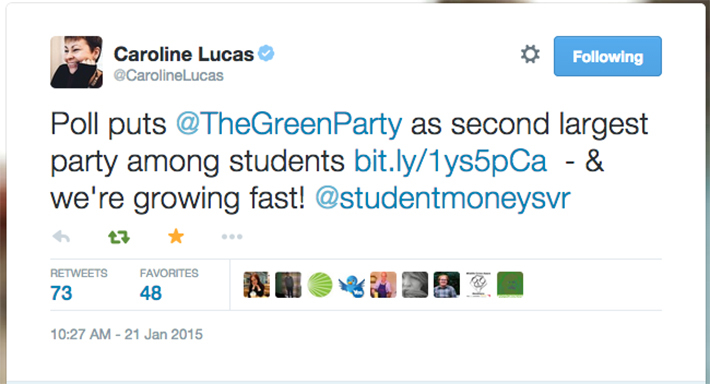 The Green Party have seen a huge increase in support amongst students, more than doubling since the 2010 election. "The Green Party is incredibly popular with students mainly because of our policies - free education for all, a £10/hour minimum wage, and genuinely affordable housing are just a few of the party's policies which would benefit young people immeasurably. Students are also attracted by the party's willingness to really engage with young people - for example, all of the party's leadership marched alongside students at last year's Free Education demonstration. "We've picked up votes from many students who supported the Liberal Democrats at the last election, but were let down by Clegg's failure to deliver on his tuition fee pledge, and ex-Labour students who feel that the Labour party no longer represents a viable left-wing alternative to Tory austerity. Many are also worried by the rise of UKIP and the negative politics of scapegoating and scaremongering that come alongside that, and see the vision that the Green Party presents as a real, positive alternative to mainstream politics. The Green Party offers the politics of hope, as opposed to a politics of fear - and gives young people the chance to vote for a future which works for everybody." This was view was backed by the survey, with Green voters gaining a large proportion of their votes from former Lib Dem and Labour voters. The Green's guess is mirrored in the survey results. The Greens gained the most votes from former Lib Dem voters, with their next biggest pool of voters coming from former labour supporters. This chart shows who students voted for last time (column) and who they are voting for this time (rows). The Lib Dems had the least loyal voters, with Greens at the most. Of the students who voted for the Liberal Democrats in the 2010 general election, only 12.9% intend to vote for them in the election this year. “We recognise that we couldn't deliver our policy on tuition fees - and we’ve apologised for this. We did not win the General Election which meant we were unable to deliver the policy without backing from Labour or the Conservatives, who both supported high fees. “Saying this, we made sure the new system was as fair as possible. No student pays up front and they only starting paying back once they're earning over £21,000 – which has led to more young people going to university than ever before, with more coming from disadvantaged backgrounds." Whilst tuition fees may have been a big issue for students, support for Lib Dems actually increased to 7.7% when asked "If you were voting entirely on education policy, who would you vote for?" suggesting that the drop in support for the Liberal Democrats amongst students is not due to the tuition fee scandal alone. “Young people should also know that the Liberal Democrats can be trusted in government and have a good record of delivery. We have protected civil liberties through blocking the Snooper’s charter and are committed to blocking it again. "We now have 25 student societies across the country after starting UKIP Students in August 2014. However, when asked "who would you vote for if you were voting on education policy alone", support for UKIP almost halved, at 4.1%, suggesting that the doubling of support for UKIP may not be due to their education policies, but other issues. Student support for UKIP has not been as high as amongst the general population. The Conservatives have lost support from student voters, going from 23.9% in the 2010 elections to just 15% intending to vote Tory in 2015. As well as being pushed into third place by Labour and the Green party, the survey found that 14.1% of students who voted for the Conservatives in 2010 are planning on voting for UKIP in 2015, and 8.1% are switching to Labour. Their support drops even further when asked to vote purely on educational policy. The Conservatives declined to comment. What if you were just voting on education policy? The survey asked who students would vote for if they were voting entirely on educational policy. When asked this question, support for the Conservatives dropped 5.1%, support for Labour remained at the same and support for UKIP almost halved. "The Lib Dems in general are to me a more people centered party, so that includes education and those in education. Nick Clegg shows that he cares about students in high school, colleges/6th forms and universities by setting policies towards them such as creating more funding and apprenticeships when often many leaders simply target primary school age and below and adults missing out teenagers and uni students. So overall, I think its the sense of being cared about and not forgotten and seen as important that makes the Lib Dems stand out. In the last 5 years, I feel like the conservatives especially David Cameron have made a lot of decisions on all topics, not just including education which have been their views and policies rather than the ones of the Lib Dems, and so their beliefs have been compromised by the Conservatives. So I think if Lib Dems had more power or fought more for their beliefs then more changes would have been as a result of them, instead they have at times just gone along with the Conservatives." The survey also looked at trust in politicians amongst students. Only 14% of student voters agreed with the statement "I trust politicians to deliver what they promise in their manifestos" and 63% disagreed or strongly disagreed. Even less thought that politicians cared about students at 10%, with 64% disagreeing or strongly disagreeing. However students still believe that their vote matters, with 53% agreeing or strongly agreeing with the statement "my vote matters". This would help explain the high intention of students to turn out and vote. The survey found that intended turnout amongst students is high - 81% of students intend to vote in the 2015 General Elections. The student population in the UK is currently 2,299,355. If the 81% of students who currently intend to vote do so that would be almost 1.8 million voters, a significant proportion of the voting population, and yet students feel that politicians do not care about them or trust that they will deliver in their manifestos. The low trust in politicians amongst students is understandable. Going into the last government the Liberal Democratics promised they would not raise tuition fees, then when they joined the government did the exact opposite. Whether raising tuition fees was the right thing to do is beside the point, students feel betrayed by politicians who argue for one thing and then do the exact opposite. It's unsurprising that we found students who had voted before are more likely to trust politicians to deliver what they promise in their manifestos, and less likely to think that their vote matters. Of those who intend to vote, 25% are still undecided who for. Thats 465,600 students who intend to vote but don't know who for yet. With such a large amount of undecided voters there is scope for political parties to woo students and swing the vote in their favour. However this does not mean politicians should offer a bribe to students such as the Liberal Democrats did in 2010. We found that the main issues students will vote on are employment, healthcare, education and the economy. To win student votes parties will need to convince them they have the best policies across all areas of government, not just education. More than that, they need to have deliverable policies, especially as another coalition seems likely. If they promise something they can't deliver within a coalition, as the Lib Dems have found, they can't count on the loyalty of young voters as they were once able to. 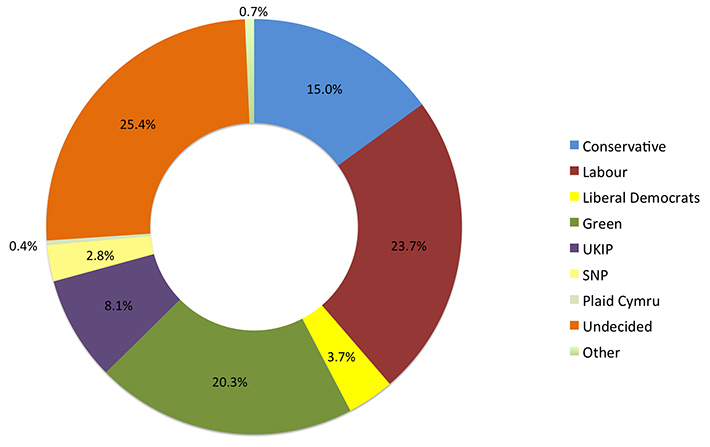 This was a snapshot poll of over 1000 of student money saver's users conducted between the 8th and the 20th January. For more information (and journalistic enquiries) please contact our content editor James Felton at james.felton@studentmoneysaver.co.uk, follow him on Twitter @SMSJamesF or ring on 0207 183 4670.